Pets can be poisoned when they eat or drink something that isn't meant for them. Products that are toxic for pets include food products but also certain medicines or plants and flowers. The overview below lists the products that can poison your pet and what symptoms to look out for. Please note: we cannot discuss all possible toxic products in this article, but we will go over a number of common products that are poisonous below. When you suspect that your pet has eaten something that could be toxic, we recommend that you always contact your veterinarian as quickly as possible. Unfortunately, there aren't known antidotes available for all toxic products. Often the acute treatment by the veterinarian consists of making your pet vomit up the contents of the stomach, pumping the stomach or performing gastric irrigation if the substance has only just been ingested. Please note: do not try to feed your pet salt at home in an attempt to make it vomit! This can actually lead to salt poisoning. If the toxic product was ingested a little while earlier, Norrit can be given in the hope that the toxic substance binds to this and is not absorbed by the body. In practically all cases the animal is put on a drip to provide extra support and it may be necessary to admit and observe them. Chocolate is toxic for pets This is the most common poisoning in dogs, as they often have a tendency to eat from the table and are quite happy to eat the chocolate along with the packaging. The toxic substance in chocolate is theobromine. The amount of theobromine varies depending on the type of chocolate. In general, the darker the chocolate, the more theobromine it contains. The sensitivity to chocolate poisoning varies per animal. This means that one animal will show symptoms of poisoning when it has consumed a certain amount of chocolate, while another animal will not have symptoms at all after consuming the same amount. To give you an idea, a 5 kg dog can show mild symptoms of poisoning when it eats 16 grams of dark chocolate or 50 grams of milk chocolate. The symptoms can start an hour after consuming the chocolate, but in some cases the symptoms only start after 24 hours. The symptoms include vomiting, diarrhoea, hyperactivity, muscle tremors, seizures and cardiac arrhythmias. It is still unknown why grapes are toxic for dogs. 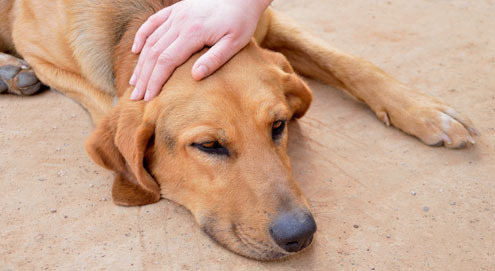 The sensitivity can vary from one dog to the next, just like with chocolate. In small dogs, as few as 2 grapes can be fatal. Clinical symptoms can occur after 6-24 hours. The symptoms include drinking a lot, weakness and refusing to eat. Eventually this can lead to kidney failure. Avocado is toxic from approximately 60 mg per kg body weight. After eating avocado, cats and dogs mainly have gastrointestinal problems such as stomach pains and vomiting. Given the high fat content of avocados, this can lead to pancreatitis in some cases. What's more, the large stone can lead to an obstruction of the bowel. Rodents, rabbits and birds are even more sensitive to avocado. When a bird eats avocado, this can lead to death within 24-48 hours. The first symptoms are poor plumage, lethargy, refusing to eat and breathing problems. In rabbits, this can lead to heart problems. Avocado is also toxic to horses and eating avocado can lead to colic and fluid accumulation around the stomach, head and neck. Paracetamol is regularly given to pets out of ignorance. But please note: Paracetamol is toxic! Mainly for cats, but for dogs too. Cats can die if you give them paracetamol, as it causes liver and kidney damage, severe anaemia with dark membranes and red urine. An "antidote" is available, Acetylcysteine, to counter the effect of paracetamol. Ivermectin is a substance that is used as an active ingredient in some worming treatments for farm animals. Dogs may ingest this substance when they eat horse manure from horses that have recently had their worming treatment. It is also used in ear ointment to combat ear mites in cats. However, this active substance is toxic for Collie-like dogs and a number of other dog breeds (Border Collie, Scottish Collie, Bearded Collie, Shetland Sheepdog, Australian Shepherd and Australian Cattledog, Old English Sheepdog, German Shepherd, Swiss White Shepherd, Long-haired Whippet, Silken Windhounds and crosses with Collie-like dogs) . Due to a mutation in a certain gene, these breeds lack a protein that ensures that the brain is protected against certain medications. Due to the lack of this enzyme, the substance can accumulate in the brain. The product causes brain symptoms such as blindness, jumpy behaviour, disorientation, weakness and comas. Permethrin (or a similar active substance, Deltamethrin) is used as the active substance in flea and tick treatment products for dogs, such as Advantix Spot-on (not to be confused with Advantage), Pulvex Spot-on, the Scalibor collar and Defencare Shampoo. Under no circumstances can these products be given to cats, as Permethrin is highly toxic for cats. The symptoms that occur include vomiting, drooling, tremors and epileptic fits. These can be fatal for cats. Should you have accidentally administered one of the above products to your cat, please contact your veterinarian. In addition, you must wash your cat with soap as quickly as possible in order to remove the active substance from the coat and reduce further absorption. The poinsettia (Euphorbia pulcherrima) can cause temporary gastrointestinal problems (vomiting, loss of appetite, lethargy). Holly (Ilex aquifolium) can cause gastrointestinal problems (salivating, vomiting, diarrhoea, loss of appetite) when consumed in large quantities. These symptoms are generally temporary. Mistletoe (Viscum album) can cause serious problems. In addition to gastrointestinal problems, it can also lead to shock and death. Please ensure that your pets have no access to it whatsoever. Snow rose (Helleborus niger) is also quite toxic. It contains natural cardiac glycosides that make the heart beat more forcefully. Like the other plants, intake can cause gastrointestinal problems, but may also lead to drowsiness, paralysis and cardiac arrhythmias. Also be careful when it comes to the needles that come off your Christmas tree, as some types are toxic to certain animals. Lilies are a popular house plants and not all pet owners know that they are highly toxic for cats. It is assumed that all parts of the plant (stalks, leaves, flowers) are toxic to cats. Eating one piece of this plant can lead to symptoms of poisoning. The first symptoms are vomiting, drooling and lethargy. These occur within 1-3 hours after ingestion. Eating this plant can cause acute kidney failure within 12-30 hours, which has a bad prognosis. There are no known antidotes. Rat poison contains coumarin derivatives that are poisonous for rats and mice, but also for dogs and cats. So you should always ensure that you keep it out of reach of your pets. These products have a (long-term) effect on the blood clotting and this causes internal bleeding that can kill the animal. The dosage that causes these problems varies depending on the product. Always contact your veterinarian and take the packaging of the rat poison in with you. The treatment consists of the (long-term, weeks to months) administration of Vitamin K, which plays a role in blood clotting. Anti-freeze contains ethylene glycol and is toxic to both cats and dogs. Anti-freeze can be very attractive to lick up because it has a sweet flavour. This is why you should always ensure that this product is stored in a safe place that dogs can't reach. The first symptoms of poisoning are vomiting, drinking and urinating a lot, lethargy and stumbling. These are followed by kidney failure with a moderate prognosis. Dogs can poison dogs when they eat drug users' stools or vomit. Unfortunately, this is quite common. The symptoms are comparable to the "symptoms" in humans. The animal can start to show weakness, collapse, start stumbling, be disoriented, lethargic and jumpy.